PC [1.3] TerrariaPatcher (plugins and more!) - works with tModLoader now! Discussion in 'Released' started by Transcend, Jul 10, 2015. Tested and working with Terraria 1.3.5.3 (and tModLoader v0.10.0.1) but it most likely works for later versions too! This patcher will permanently modify the Terraria.exe to your preferences. The patcher will ask if you'd like to back up the original Terraria.exe, you should do this so you can restore it at a future time if you don't wish to use your modifications anymore. 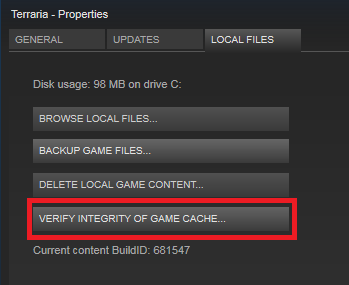 If you don't do this, you can use Steam to reinstall a clean copy of Terraria. Do not try to patch Terraria.exe twice.. Unintended results may occur. Always patch a fresh copy of Terraria.exe or tModLoader's Terraria.exe. Terraria updates to new version via Steam. Oh no! All your mods are gone, what will you do?! 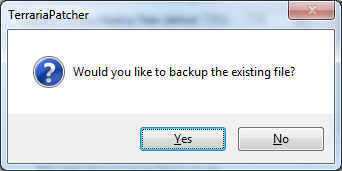 Patch the new Terraria.exe and hit NO to the message asking if you want to restore the old backup. YOUR OLD BACKUP IS AN OLD TERRARIA, WHY WOULD YOU RESTORE IT?! Q: Does this support Mac/Linux? A: No and it never will. Q: Does this support Windows XP? Q: When I run Terraria via Steam after patching I get a message that says "Please launch the game from your Steam client" or something similar. A: Run Steam with administrator privileges then run Terraria via that elevated instance. Q: While patching or on Terraria startup I get a message saying the file is in use or access is denied. Don't run the patcher inside your Terraria folder. Run it from your Downloads folder or something. Check that you are running the patcher with administrator privileges. Make sure Terraria is closed when you are patching. Q: My anti-virus is removing TerrariaPatcher and/or my patched Terraria.exe. Why does my anti-virus think your tool is malicious? A: If you think about it, the intent of the program is somewhat malicious. Your anti-virus is correctly identifying that your patched Terraria.exe has dynamic code compilation (used for plugins) and is suspicious. Your anti-virus is also correctly identifying that the TerrariaPatcher itself has code to modify other executables (Terraria.exe). This is a behavior used by many malicious viruses/worms. If you have doubts about using TerrariaPatcher for fear of it being a virus, just remember the entire project and all plugins are open source and can be inspected by anyone. Feel free to add/contribute your own plugins! It is simple and easy to add new plugins. If your plugin is cool I can add it to the existing ones I am distributing. 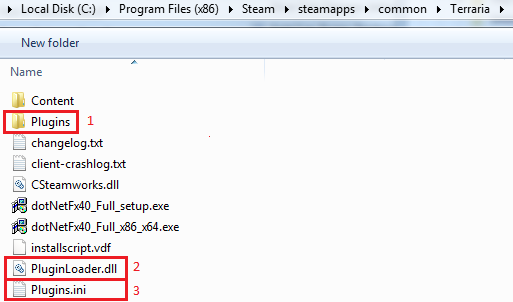 After running Terraria you will see a Plugins.ini in your Terraria folder as seen in (3). This will contain any configuration relating to the plugins you have. Valid hotkey modifiers are 'Control', 'Shift' and 'Alt'. Or use the Bind plugin to manage hotkey bindings. Press the hotkey (default L) while you have the map on fullscreen to reveal the entire map and temporarily store your old map. When you press the hotkey again the plugin will restore your old map. So this plugin is a great way to just quickly glimpse at the whole map to see where certain biomes are when you are first starting out. WARNING: May corrupt your map, make backups of your map before using. I'm investigating this issue. Press the teleport hotkey (default F) to teleport your player to the cursor location. While you have the map on fullscreen you can right click anywhere on the map to instantly teleport there. Press the night hotkey (default comma) to set the game time to midnight (12:00 AM). Press the day hotkey (default period) to set the game time to afternoon (12:00 PM). Press the day hotkey (default period) + CTRL to set the game time to dawn (4:30 AM). Press the rain hotkey (default semicolon) to toggle rain. Press the slime rain hotkey (default quote) to toggle slime rain. Add this plugin to your Plugins folder, run the game once to get your Plugins.ini to update with a [UseTime] category, close the game, then edit the values in Plugins.ini to your preferences. Setting MaxPickSpeed to true makes Picks/Drills/Hammers/Axes have use time of 1. Setting MaxTileSpeed to true makes placing blocks/wire have use time of 1. Setting MaxWallSpeed to true makes placing walls have use time of 1. Setting MaxReachRange to true allows you to reach very far when trying to mine/place blocks/etc. Setting MaxItemPickupRange to true allows you to pick up items from very far away. If you have the ItemConfig plugin installed, your /autoreuse and /usetime changes will persist after restarting Terraria. Allows you to get insane lifesteal while using Spectre Armor or Vampiric Knives. Add this plugin to your Plugins folder, run the game once to get your Plugins.ini to update with a [Buffs] category, close the game, then edit the values in Plugins.ini to your preferences. By default there is no modification. You must manually change the values if you want any improvements to these buffs. Supports Archery, Rage, Wrath, Magic Power, Endurance, Ice Barrier. Press the hotkey (default N) to toggle NPC spawns. Press the increase hotkey (default +, not on numpad) to increase spawn rate. Press the increase hotkey (default +, not on numpad) + CTRL to increase spawn limit. Press the decrease hotkey (default -, not on numpad) to decrease spawn rate. Press the decrease hotkey (default -, not on numpad) + CTRL to decrease spawn limit. Adds homing capabilities to all projectiles of aiStyle of 1 (bullets / some arrows). Please test this out and give feedback! Add this plugin to your Plugins folder, run the game once to get your Plugins.ini to update with a [MoreAccessorySlots] category, close the game, then edit the values in Plugins.ini to your preferences. Set Force = true if you want to enable this mod at all times (even when you haven't used a Demon Heart in expert mode). Set Count to the number of extra slots you want. Normally the Demon Heart only gives you 1 but this mod will allow you to receive 2 instead. Hold down CTRL then type in the item code you want to spawn using the numpad, then release CTRL to have the item spawned. You can find item codes by searching for items on the wiki. Allows you to set custom respawn timer for your player. Default is 0 seconds so that you instantly respawn. Toggle infinite flight with rocket boots, magic carpet or wings using the default hotkey I. Cycle through 3 modes (Off, Demi-God, and God) with the default hotkey G or cycle backwards with SHIFT+G. Demi-god mode will not allow you to die, but you can still get hurt. God mode attempts to keep full health, prevents fall damage, drowning, and keeps you immune to all debuffs. Allows you to set custom max # of minions for your player. Default is 100. Allows you to set custom max # of turrets for your player. Default is 100. Add this plugin to your Plugins folder, run the game once to get your Plugins.ini to update with a [CoinGunModifications] category, close the game, then edit the values in Plugins.ini to your preferences. Setting *CoinEnemyTracking to true makes your coins act like Chlorophyte Bullets (tracking enemies). Setting *CoinDamage to a value modifies the damage your coins will do. Hold the ReplicateKey (default is R), right-clicking on any item in your inventory will duplicate the item instead of splitting the stack like normal. Skips the initial splash screen when loading the game. Toggle full bright using the default hotkey Y.
Patch with TerrariaPatcher v1.2.0.4 or later. Go to the Inventory Enhancements page (http://forums.terraria.org/index.php?threads/26520/). Download the "Inventory Enhancements (TP)" attachment and the Configurator attachment. Copy Configurator.exe to your Terraria game folder. 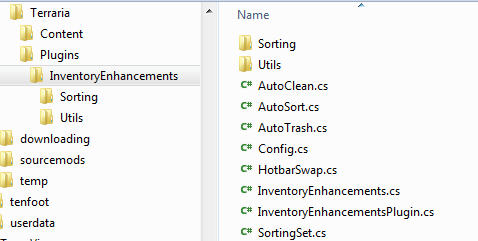 Copy InventoryEnhancements folder into your Plugins folder. Turns on christmas or halloween modes permanently until you toggle them off again with a command. The values are stored in Plugins.ini so that they persist. The Merchant will now sell you potions that scale with your health and mana. Allows you to use the sundial over and over without waiting for the cooldown. Adds a new button when you open your inventory to allow you to search nearby chests for a keyword. Adds a new button when you open your inventory to allow you to quickly swap your armor/accessories with the vanity ones on top. Press the decrease hotkey (default is O) to lower the item drop rate. Press the increase hotkey (default is P) to increase the item drop rate. Press the rare-drops-only hotkey (default is Right CTRL) to toggle the plugin only affecting rare-drops instead of all drops. Drop rate can go from 0 to 20. 0 will give you no drops. 20 will give you 20x the drops you would normally get. Add this plugin to your Plugins folder, run the game once to get your Plugins.ini to update with a [BuffImmunity] category, close the game, then edit the values in Plugins.ini to your preferences. Adds permanent immunity to the buffs you specify. Press the hotkey (default is U) to toggle a small light on your cursor. Press the hotkey (default is C) to open the crafting guide anywhere, without needing the Guide NPC. While holding the Cell Phone, right-click to change modes between Home, LeftOcean, RightOcean, Hell, Random. Then use left-click to activate. WARNING: Careful when using Hell mode, it might and probably will put you in lava. Changes the currently held or selected item to have the given prefix. Your position on each world will be persisted after exiting the game. So now you can be put right back into your underground expedition after re-loading your character. Persist various changes to item stats. See the plugin's source code for an example on how to write a stat modification. Current modifications include: name, autoreuse, damage, knockback, crit, defense, usetime, useanimation, holdstyle, maxstack, scale, tooltip, tooltip2. Required to persist UseTime plugin alterations. v1.2.0.36: Updated to work with tModLoader v0.10.0.1. v1.2.0.35: Updated for Terraria v1.3.5.3. v1.2.0.34: Update for Terraria v1.3.5.1. v1.2.0.33: Added Large Address Aware patch. v1.2.0.31: Added Functional Social Slots patch. v1.2.0.29: Updated to work with tModLoader v0.9.0.0. v1.2.0.28: Fixed item prefix patch for real! v1.2.0.27: Fixed item prefix patch. v1.2.0.26: Updated for Terraria v1.3.4.3. v1.2.0.25: Added InventoryEnhancements to distribution. v1.2.0.24: Added code to bypass github caching for updates. v1.2.0.23: Updated for Terraria v1.3.4.1. v1.2.0.22: Updated for Terraria v1.3.3. v1.2.0.21: Updated for Terraria v1.3.1. v1.2.0.20: Changed admin checks to warnings instead of halting. v1.2.0.19: Attempt to fix administrator warning. v1.2.0.18: Fixed bug with checking when files are locked. v1.2.0.17: Added many different warnings about running as admin, files being in use, and files missing. Added Terraria.exe.config to help people who don't have .NET Framework 4.5 installed. Fixed infamous tile/wall issue when using UseTime plugin with Builder potion or items like Architect Gizmo Pack. Fixed using hotkeys while game is paused (PortableCraftingGuide, ChestSearch, etc). Fixed Season plugin, works on load now. v1.2.0.14: Added '/prefix keep' command to ItemPrefix plugin. Fixed '/usetime' command to preserve autoreuse/favorite status when resetting item. Fixed PortableCraftingGuide plugin to properly read inventory key. Added 2nd proc of Luminite Arrows to HomingPlugins plugin exclusions. Fixed PortableCraftingGuide to use inventory key set in Terraria config. v1.2.0.12: Added filter for persistent buffs on UI. Added sync feature to Copy Plugins window, to help delete plugins you deselected. Added customizable timer to Respawn plugin. Moved Demi-God mod to the GodMode plugin. Renamed EnhancedPDA plugin to EnhancedCellPhone. v1.2.0.11: Added command '/usetime' to reset to original value. Added Electrosphere Launcher to HomingBullets plugin exclusions. Updated DropRates plugin with Rare-only drop rate toggle. v1.2.0.9: Fixed Newtonsoft.Json.dll extraction issue with Terraria 1.3.0.7. Added administrator privileges warning when patching. Added new 'spawn at cursor' command for NPC plugin. Added /range command to UseTime plugin. Added /plugins command to loader. Added new hotkey-command bindings. Check plugin notes. Added new Shared folder for shared plugin source code. Added plugin support for IPluginInitialize, IPluginDrawInventory, IPluginUpdateTime. v1.2.0.6: Added plugin support for IPluginNPCLoot. v1.2.0.5: Added plugin support for IPluginPlayerQuickBuff. v1.2.0.4: Changed blocks/walls/wires to use usetime 1 instead of 0.
v1.2.0.3: Added plugin support for IPluginChestSetupShop. v1.2.0.2: Moved Full Bright to a plugin with toggleable key. Added '/teleport plantera' and '/teleport strangeplant' commands to teleport plugin. Removed teleport plantera hotkey. Changed UseTime plugin to use 0 instead of 1 for picks/drills/axes/blocks/walls/wires. Added Builder buff / UseTime plugin warning. Reverted Reveal plugin changes.. Causing memory issues. Added ability to load plugins from subfolders with group compilation (allows for larger plugins). Fixed UseTime (autoreuse) command bug. Fixed GodMode plugin to use statLifeMax2 instead of statLifeMax. Fixed Reveal plugin to use UpdateLighting instead of Update method. v1.2.0.0: Updated for Terraria 1.3.0.5. Added command functionality to ItemSpawner, NPC, Time, and UseTime plugins. v1.1.0.12: Changed UseTime to use [UseTime] category in Plugins.ini. Added Actuators to UseTime plugin. Added many warnings to patcher. Moved Coin Gun to a plugin. Moved Max Tile Speed, Max Wall Speed, Max Pick Speed, Max Reach Range and Max Item Pickup Range to UseTime plugin. Updated UseTime plugin to work for Wrench, Green Wrench, Blue Wrench, and Wire Cutter. Fixed HomingBullets plugin for when you have Pygmy or Twin minions. Fixed NPC plugin, specifically spawn rate modification. Fixed BuffRates plugin, specifically rage. v1.1.0.10: Fixed another plugin hotkey bug. v1.1.0.9: Added thread link & update warning on main UI of patcher. v1.1.0.8: Fixed ItemSpawner to spawn items on yourself instead of player 1. Moved spawn rate/limit to NPC plugin and allows dynamic adjustment of the values. Added endurance buff and ice barrier (from Frozen Turtle Shell) to BuffRates plugin. v1.1.0.7: Converted Item Replication to a plugin. Updated plugin hotkeys to only work when chat/chest edit/sign edit windows are closed. Updated Events plugin Moon Lord to use separate hotkey instead of CTRL modifier so that ItemSpawner doesn't conflict. Fixed bugs in HomingBullets plugin. Fixed typo in BuffRates plugin. v1.1.0.5: Added BuffRates plugin (archery, magic, wrath, rage). Converted 'Infinite Healing' into a plugin called InfiniteLifeSteal. v1.1.0.3: Fixed bug with angler quest limit mod. v1.1.0.1: Fix for languages that use commas instead of periods in their decimal format. v1.1.0.0: Added config save/load functionality (all UI changes are persistent now). v1.0.4.2: Fixed 'Remove Mana Costs' for channeled items. Updated 'Inventory Item Replication' by Ryan. Changed UI to be more horizontal and is now resizable. v1.0.4.0: Updated to work with Terraria v1.3.0.2. Removed tUnlocker since dev items are allowed now. Added 'Max Tile Placement Speed'. Added 'Max Wall Placement Speed'. Added 'Max Item Pickup Range'. v1.0.3.6: Changed 'Infinite Split Stacks' to 'Inventory Item Replication (R + Right-click)'. v1.0.3.5: Added 'Infinite Cloud Jumps', 'Remove 2 hearts/second healing limit', 'Vampiric Knives Healing Rate', and 'Spectre Armor Healing Rate'. v1.0.3.4: Added accessory preference for 'Always Roll Best Prefixes'. v1.0.3.3: Added 'Always Roll Best Prefixes'. v1.0.3.2: Added 'Infinite Ammo' by Ryan S.
v1.0.3.1: Added 'Infinite Split Stacks' by Ryan S.
v1.0.3.0: Added 'Remove Drowning', 'Demigod Mode', 'One Hit Kill'. v1.0.2.2: Disabled 'Thorns Buff' since it was causing issues. Increased the 'Persistent Buffs' limit to 22 since that is the actual limit in Terraria now. Added 'Remove Angler Quest Limit Per Day'. v1.0.2.1: Updated to match the 1.2.4 buffs. v1.0.2.0: Updated to work with Terraria v1.2.4. v1.0.1.3: Updated to work with Terraria v1.2.3.1 and its new buffs (Ammo Box, etc). Added 'Magic Power Buff' damage rate modification. v1.0.1.1: Small fix to detect newer InventoryManager.dll and copy it over for the user. v1.0.1.0: Updated 'Spawn rate for Demon Voodoo' to work with 1.2.1.2.
stefnotch, SouL Hunter, Chop and 31 others like this. Hey, I can't get the item spawner to work, and under the INI settings it has the keys J+Numpad, I tried that too and it also didn't work. Thanks, not sure how this one got by me. I'll have an update in a couple mins. just an issue i got whenever i patched my first character was no longer playable it was there but i couldnt click the option to play possible bug? Do you use any minions? No, I just was building a house, and when I walked out of it, it just went ham. It was impossible to even move my mouse cursor. It was raining if that helps. I cant go to the link. It says "Appliance Error". EDIT: Got it work from TO. Ah yes. It is because of the smart cursor mode. You have a large block placement range. So once you walk out of your enclosed area, the smart cursor will be checking a wide area of tiles due to the way it works. Please just turn off smart cursor mode or simple switch away from the tile item you were holding. This is great. Works perfect for me. Thanks for all your work. Read the main post, particularly the section on plugins. Reading saves lives. When the  Builder is added to persistent buffs, any items like blocks/torches/etc I select on my action bar rapidly countdown until they are no longer in my inventory. Can you add a boss spawner?????? Thanks for this! BTW, where can I find more plugins? *****punchYT and Nyimsava Ahat like this.